ACNC finally returns with part one of the highly anticipated case of the Eyeball Killer. Also known as the Dallas Ripper and the Dallas Slasher, this killer targeted women in the Dallas neighborhood of Oak Cliff during the years 1990-1991. Then in Good News Shea brings us a rescue story about a miniature horse. And finally we wrap things up with shout-outs for our Patrons. Visit our Patreon page to support the show and earn some awesome rewards: https://patreon.com/allcrimenocattle. Check out ... See More our merch shop: https://allcrimenocattle.threadless.com. 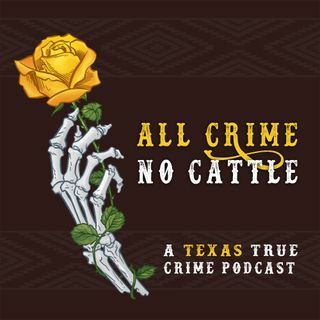 Find us on Twitter: @ACNCpodcast and on Instagram: @allcrimenocattle. Tip Jar: https://paypal.me/allcrimenocattle.